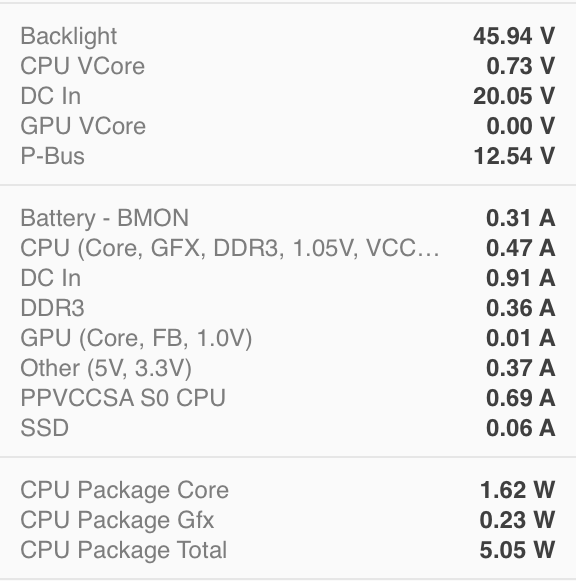 I was wondering if it is possible first of all to get the overall power consumption for my MacBook? And if it is possible can I get this power consumption for each peripheral running (like consumption CPU, GPU, Wifi,...)? Have checked the activity monitor, but nothing really interesting there, except for a very vague energy impact number. You can use iStat Menus to read the sensor values, which include voltage, amperage and wattage of various components in the system. Not the answer you're looking for? Browse other questions tagged mac power activity-monitor .